This is one of my husband's favorite desserts. 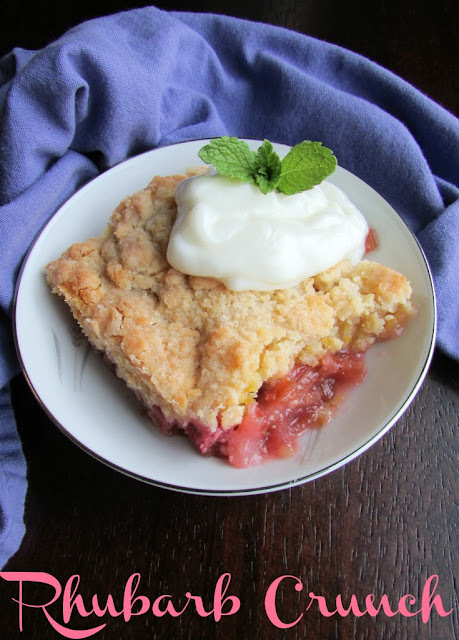 A layer of rhubarb is covered in a sweet buttery crust for the perfect sweet tart treat. My husband has been begging to plant some rhubarb at our house ever since we moved here. Four and a half years later and we still don't have it! It's not that I don't want it, it's just that we never think of it at the right time. I think he only wants it so he can have this Rhubarb Crunch on an annual basis anyway. So when my parents moved to a place with rhubarb, we were in! Now that doesn't mean that we won't be planting a plant ourselves, it just means we can have rhubarb crunch in the years between now and the time it actually happens! My husband doesn't go on and on about food very often. I hear about his mom's lasagna, that is definitely a favorite. One of the other recipes I've heard about is this one. So it is about time I actually make it! So I swiped some rhubarb from my parents. (Actually MiMi gave it to me, don't worry!) Then I quick got the recipe from my mother-in-law, Nana. She said it actually came from my husband's grandma and generations of his family have been enjoying it. You know I love a good family recipe! The recipe is actually really simple. 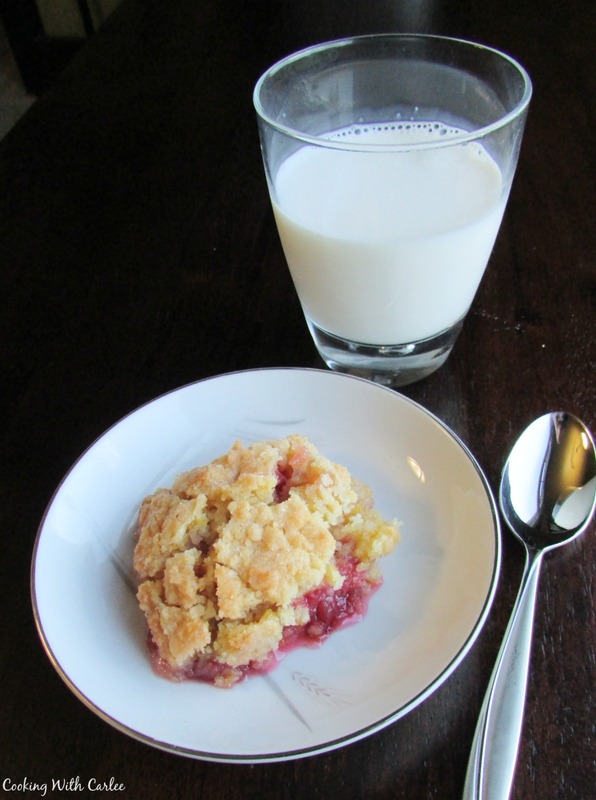 Rhubarb is really tart on it's own, so it requires a good amount of sugar to make it palatable. Luckily I always have a healthy supply of Dixie Crystals on hand. You never know when you might need to make a dessert! So simply toss the chopped rhubarb in some sugar and place it in the bottom of your pan. Then you make a quick crumble to sprinkle over the top. The juice from the fruit and the crumble come together to make something wonderful! I can see why this is one of those recipes that my husband has an affinity for! My husband's grandma suggested to serve this with a glass of milk on her recipe card. That is truly a great combination. A little fresh whipped cream would be good too, but I could eat freshly whipped cream on just about anything. Today I decided to serve it with a dollop of vanilla yogurt to go along with the brunch theme and that was great as well! 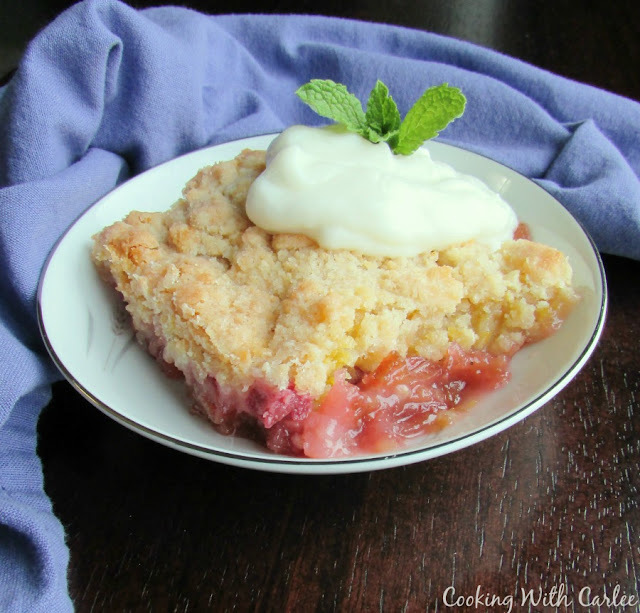 I haven't done much experimenting with rhubarb before this. So now I am wondering what are your favorite rhubarb recipes? Butter an 8x8" pan and preheat oven to 350 F. Combine rhubarb and first cup of sugar and spread in the bottom of prepared pan.Whisk together flour, sugar, baking powder and salt. Cut in butter, then egg. Mixture should be crumbly. Sprinkle over top of rhubarb, then bake for 40-50 minutes.Recipe can be doubled in a 9x13 pan. This is my fav and my husband's..bring on the rhubarb!!! And wishing you wonderful Mother's day beautiful lady...you are the BEST!! Thank you so much, Andrea! I hope you had a great Mother's Day as well! This looks exactly like the recipe I have been searching for after enjoying some at a ladies brunch. I was unable to find out who brought it so I never got the recipe. I am not a fan of rhubarb but love this crisp. How fun! It would be interesting to know if it was the same! I should make this for a family get together sometime. My family all LOVES rhubarb! You should! I need to get more! 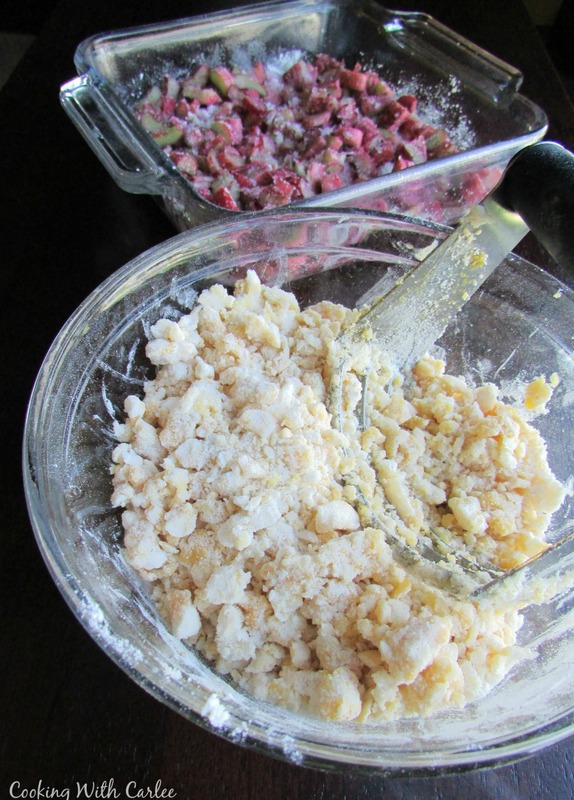 Your Rhubarb Crunch would be a great addition to any brunch! Thanks so much for sharing this awesome post with us at Full Plate Thursday. Hope you are having a great day and come back soon! I don't have nearly enough of them, but I am glad I finally got to make this one! I am really excited to be a part of the team, thanks!